I am two weeks into second year medical school, and the majority of our content has been NeuroAnatomy and Brain Diseases. As a physician it is pretty darn important to be able to figure out when someone is having a life threatening stroke impinging on brain tissue, versus a flare up of a genetic disorder that is starting to show neurological signs and symptoms. Knowing the anatomy of the brainstem, and the arrangement and progression of the long tracts of nerve fibers throughout the spinal cord, medulla, pons, brainstem and beyond can create a Cartesian like diagram where one can fairly accurately isolate the nature and location of the lesion. That is, if you can remember where and how everything goes. 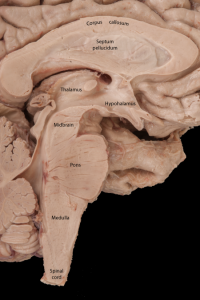 I never quite knew where the medulla was even located, and now I know more than I probably ever will again about the arrangement of nerves, radiations and nuclear cell bodies in its little bulbous body. This tiny part of the body has nerve fibers that do cardiorespiratory regulation, the trigeminal cranial nerve nucleus, tracts, and radiations for face sensation, ascending dorsal column and spinothalamic sensory tracts for the entire body, descending corticospinal and pyramidal motor tracts for the entire body, and some complicated cranial nerve regulating nucleii that coordinate the eyes and hearing. As you go up fun things show up like the olives, and the solitary nucleus and nucleus ambiguous (both associated with the vagus nerve.) And, the tongue. Problems with the tongue can be from a medullary lesion including slurred speech and not being able to stick your tongue out at someone very effectively, because it points wiggly off to the side the damage has occurred. There is probably more things in this tiny medulla oblongata, but I cant remember them right now. Back to the topic of stroke. And willpower. Smoking is a huge risk for stroke, especially intraparenchymal stroke. 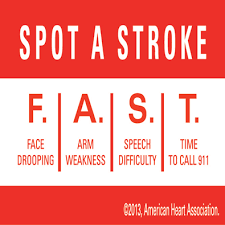 45% of people die within the first 30 days of having a stroke. Why? Because the brain is special. And when you put pressure on it, by adding more fluid (blood) into a closed small area (the skull, or calverium as I love calling it) then, the brain tissue simply LIQIUIFIES in an effort to make more room. Disgusting right?! When your brain liquefies, you get signs and symptoms associated with damage in that place – if you hit a small area and just nerves and radiations of nerves, your body can often recover loss of sensation or muscular weakness on one side of your body. When you hit a nerve nucleus, like the facial nerve cell body nuclei, you probably wont recover those functions because the cells themselves are dead. Apparently I still need to learn more about strokes, especially the ones that can kill you. What I do know, is high blood pressure, diabetes and smoking are huge risk factors for stroke, and those are all related to will power. So, you do have a choice, like I do, about how to live on a day to day basis. I am choosing to decrease my daily alcohol content to improve my studying. What will your choice be?